A note to my customers, my wife passed away last July and it has completely thrown my for a loop, I have been unable to find the time to get in my shop and fill orders because of having so little time to dedicate to my business efforts what with my now having to do all the household chores and try and cook for myself. BLACK, VERTICAL CROSS DRAW HOLSTER. Vintage, Colt 45, 1940’s Classic M7 US. Government Style Crew Served Vehicle, Holster. Originally for the Soldier or Marine and his Colt 45 sidearm. Now reworked for the Active Outdoorsman, Sportsman, Or the Shooting enthusiast. Fit’s all 1911’s & full sized Glock’s and H&K sized auto’s. This Holster has been Redesigned to Fit Most modern full sized semi auto pistols with larger trigger guards and double stack mag’s. High quality construction, we use a four part laminated and bonded method to produce a hard shell holster for your lasting enjoyment. Note to customers, all bravo34 holsters are “dual use” that is to say they can be worn as a shoulder holster, or around the waist as in the hip or belly gun position. Now all holsters come equipped with a one size fit’s all Harness. If you fined that you have excess that cannot be adjusted to fit you perfectly, it can be shortened at the bottom end at back of holster and at the end near the left shoulder blade at the fold back tabs. For additional information on all of our products, please search the web for Outlands Action Tactical Products. You can also search Google images of the bravo 34 holster, and there you will see color patterns and additional items for sale. I do full Custom workup’s on just about any full sized pistol / revolvers. Semi cross draw chest mount’s. Stays secure and out of the way. Less chance of tangles with your surroundings. ” One Size Fit’s Most”. 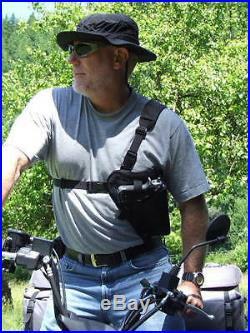 Holster was designed to take all Makes & model’s that are styled after the 1911, full framed auto’s. This Holster will take “some” large Caliber Revolvers as well , with shorter barrel lengths. Special (adjustable) design on pistol grip retainer strap allows use with even the largest double stack mag pistol grips. Constructed of the finest materials, utilizing a four – part laminated hard inner shell construction process. Mold and water resistant. Unlike leather, unit will not mold or chalk. 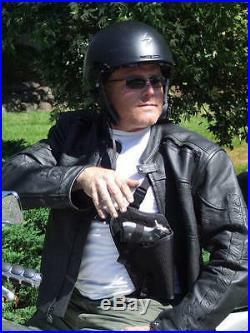 This Holster includes a Padded, ” Finish friendly interior”. This feature Creates a true ” Nesting effect ” for a more perfect fit & protection of the weapons finish. Dimpled soft vinyl shoulder strap pad. Provides maximum comfort with extended wear. All holsters Constructed from the same Materials. 1050 Denier, Ballistic Nylon. Carefully Handcrafted by Gunny Doug. 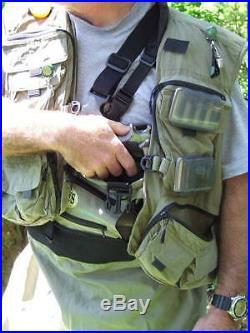 Bravo34 shoulder holster video can be seen at youtube filed under. Oldtanker 2002 See these 2 Videos and Order soon. Check out bravo three four dot com on the web. With any questions about patterns / sizes, availability. Now available from Outlands Action Tactical. INTRODUCING THE BRAVO -34. Vertical Cross Draw Holster. In these uncertain times you may want to , or have a need to carry your favorite sidearm. When you go afield. This Holster design allows you to be extremely active and still maintain control over your sidearm. Best used for open carry, but it can be used for full or partial concealment by adding a full fitting outer garment.. Soldier & Marines : Are you readying yourself for a deployment? This Holster is a good choice for packing your own personal sidearm when you’re back in the FOB , or Inside the Wire as they say, and are required to be armed at all times. Unlike the Leg Rig’s , it’s closer at hand and out of the way of chair tangles and other snag factors. So if you Fly or Ride. 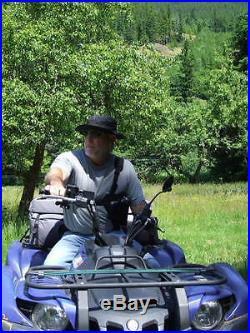 / Ride on, any Quad , Chopper, Snow machine. Go horseback, or patrol in a vehicle. Go Bow Hunting, Outlands overnight hiking, Camping , etc. This holster is for you. Can be worn as open carry over your outerwear, or over your inner layers, but under a shirt jacket or coat for additional protection from the elements, or for full concealment. Fishermen, & Fly fishermen, Fishing with the bears? You can carry while wearing chest wader’s , under your vest and inside the waders, and still have access to your pistol. The item “Cross Draw fabric shoulder Holster, Glock, H&K, High-Point, Sig, Springfield, etc” is in sale since Tuesday, February 4, 2014. This item is in the category “Sporting Goods\Hunting\Holsters, Belts & Pouches\Holsters”. The seller is “tanker2002″ and is located in Federal Way, Washington. This item can be shipped worldwide.